You can expect some of my other short stuff to be available there before too long. Once I get a chance to submit it and everything. In writing news, I am still working to finish up the SuperSecretProject before NaNoWriMo begins. (Not that it's going to happen, but you know, words is words.) I am very close to the end and it's killer. And disturbing. I love this little book so much it's hard not to talk about it in more detail, but I can't because reasons. Once the SuperSecretProject is done (by which I mean the first draft is safely in the hands of The Agent for further review), I will be starting on a new project for the duration of the year. The goal is to knock out a bunch of it during the National Novel Writing Month. Not so much because I have to participate in NaNo, but it is a good excuse to stay on target with the daily wordcount. The new project is a Space Opera with a complex set of character that are simply terrifying me because I am very much afraid I will screw them up. But, my best stories tend to be those I fear I won't do justice to. So, come tomorrow, I will be running full tilt into the writing breach to try and finish my third project this year. Or, at least, get a good start on it before January. There's been a long silence here. Between this time last month and now, there's been a lot of real life chaos that has made updating the blog a minor priority. Good news: Things are finally settling down somewhat. 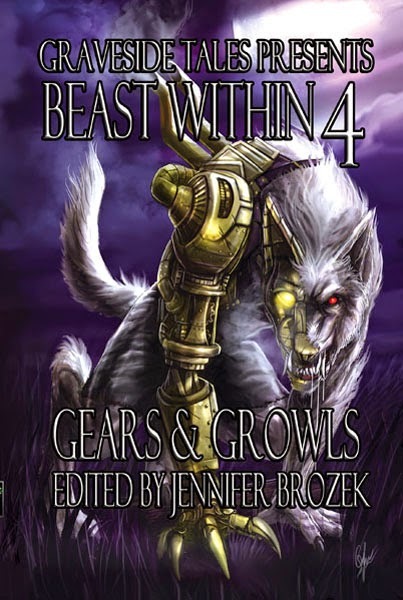 AND, The Beast Within 4: Gears and Growls is scheduled to come out on October 31st. Just in time for Halloween. And check out this amazing cover! This anthology not only contains stories by Ken Liu and Folly Blaine, but also my own - Legacy. It's a dark little thing full of weird tech, skin-changers and voodoo. I'm so excited it's finally going to be available; links to buy will go up once they're live. In the meantime, more words are on the horizon. As always.